This is my kitchen brigade. Despite their youth, they’re a skilled, enthusiastic and highly trained crew, excellent at pouring, measuring, stirring and rolling out. They’d be at home in the world’s best kitchens. They also like to listen to Iggy and the Stooges whilst cooking. 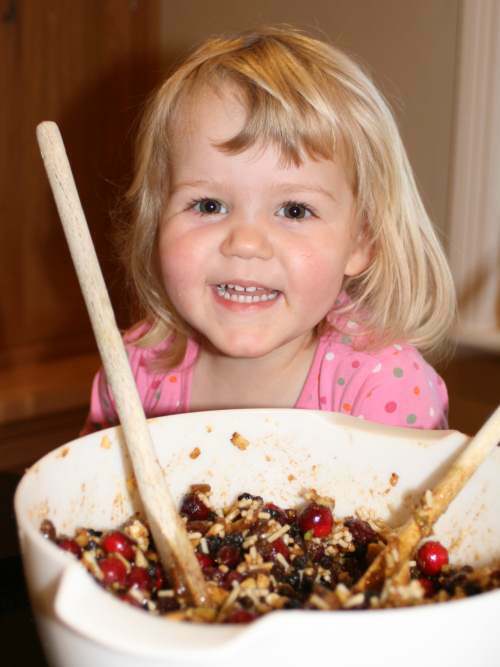 This weekend, we made a batch of mincemeat for Christmas mince pies. Despite all things Christmas being officially banned in our house until at least Advent, mincemeat is the single exception as it needs a few weeks to mature in the jar before use. At times of great tradition, it’s natural to turn to a national institution for guidance, so, we dug out Delia Smith’s gloriously eighties Christmas for this recipe. Christmas was probably out of date before it was even published, but all the classics are there, in precise detail. The structure of the recipe is good, but we modified some parts as we went along, more for speed and safety than anything else (I value my fingers, and those of my kids, so I didn’t chop the whole almonds into slivers with a sharp knife, as directed. Almonds are roundish, and have a tendency to slip around under pressure from a blade. I also didn’t have a year in which to accomplish this task, so I used a food processor instead. Really, who has ever actually sliced an almond by hand?). 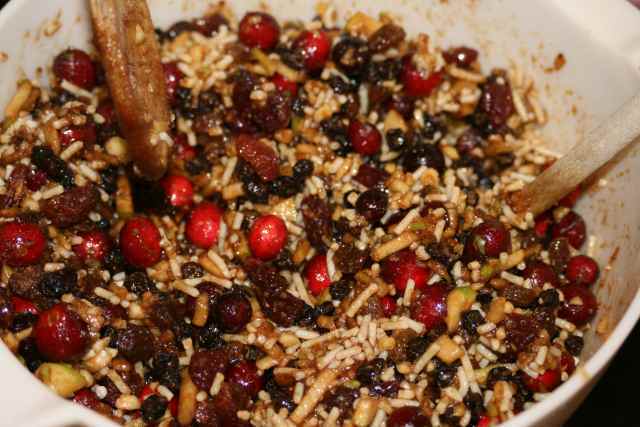 Mincemeat is a simple assembly job, with a lot of stirring. Ethan measured 350g of stunning, large, red raisins, 225g of sultanas and 350g of currants into a big bowl. Lara decided that she’d had enough of Iggy Pop and asked for The Beatles. I zested two oranges and two lemons, added the zest to the bowl, and we all had a go at squeezing the juice over the dried fruit. Delia calls for two Bramley apples to be finely chopped up, which seemed a tedious operation, so I chopped one up into small but still substantial chunks and grated the other with the large holed side of a cheese grater. 225g of suet went into the bowl, along with 450g of fresh cranberries and 350g of soft brown sugar. We then had to transfer everything to a much bigger bowl for maximum stirring-up room, adding 4 teaspoons of mixed spice, half a teaspoon of cinnamon and a good grating of nutmeg. The cranberries cut the sweetness of the other fruit and the sugar, the spices make it all taste of, well, Christmas. We also added the chopped up almonds, 50g, and 225g of candied peel, which Delia insists should be bought in a single piece and chopped by hand, but I’ve never seen it sold as whole pieces, so we had a little tub of good quality Italian peel, which tasted just fine. 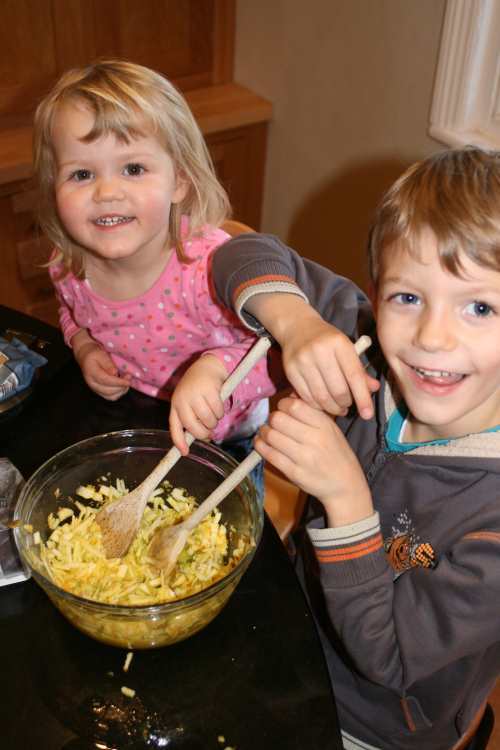 Everybody had a turn at stirring the mixture, some of us using two wooden spoons at once for added efficiency. Most of the mincemeat stayed in the bowl. The mixture needs to rest overnight to allow the flavours to develop, and then it’s cooked on a very low heat (150c) for a very long time (3 hours), loosely covered in foil. The heat gently melts the suet, which coats the fruit and helps to prevent the apples fermenting in the jar. I have an annual discussion/argument with a friend about whether or not mincemeat should be cooked. She’s adamant that it doesn’t need cooking, and cites the fact that her recipe comes from Betty’s as proof that it must be correct and has been used in her family for years. I tried this method once, and ended up with several jars of bubbling and highly explosive mincemeat that seemed to have gone off a bit, so I lost my nerve and followed the first rule of cooking…if in doubt, chuck it out. I consulted My Brother, The Chef, who just laughed at me, as normal, and said that mincemeat has got be cooked, unless you want to risk getting botulism or similar. I’ve cooked mincemeat ever since. After three hours, the mincemeat smells wonderful, but looks a mess, swimming in fat. It needs cooling down to let the fat coat the fruit and set. I do this by placing the bowl in a sink full of cold water and stirring gently but constantly for about five minutes. Be careful not to crush the cranberries. Pack the mincemeat into sterilized jars, place in a dark cupboard and wait until at least December before even thinking about making a mince pie.